Tax Justice Network: Taxes: boosting private sector growth? Taxes: boosting private sector growth? 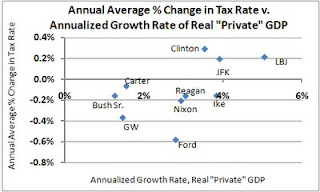 "Since Ike took office, only three administrations (JFK, LBJ and Clinton) increased the percentage of the private sector GDP that goes to taxes; they make up three out of the four administrations with the fastest increases in the annualized real private GDP. Regular readers also may recall those are the three administrations with the fastest annualized increases in real GDP per capita, including the government portion of the festivities. I dislike paying taxes as much as a Glenn Beck does, but the story line about big bad taxes choking off the private sector doesn’t add up." 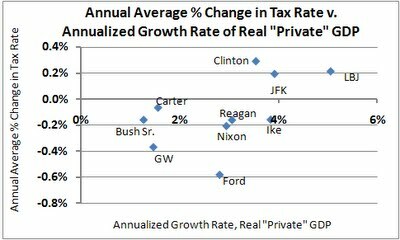 "The annual average increase in real private GDP is about 2.4% for administrations that cut share of private sector GDP going to taxes, and 4.2% to the administrations that increased it." What is this data set? Read the full article, and explanation, here.